2017 was a tough year for me - I want to write about it soon, just not yet. But 2018 is a new year and a new start. I don't like when people do the whole "new year, new me" thing but I can totally relate this year. Actually, I take that back. I don't want to be a new me. I want to be back to the old me. Before April of 2017. Even though last year taught me an awful lot. And I changed as a person. I want to keep hold of everything that I learnt but go back to the person I was. I wasn't stressed, worried or depressed. I was just me. I have made a huge amount of progress in the last couple of months and now only have bad days maybe once a month. And it's not a "time of the month" kinda bad day. It's an actual bad day. Where I cry all day and don't want to leave the house or eat. Although I don't have these days often, I do still have them. And I want to work towards not having them at all. Anyway, getting away from all of that. I want to make positive changes this year to my life. Usually, I set myself the goal of "getting fit" but then I never do anything about it. Well this year should be a heck of a lot easier seeing as though I am living somewhere where it is sunny almost every day. I recently bought rollerblades!! I used to rollerblade as a kid around London with my brothers so I know I can (could) do it. It has taken me a couple of tries to get back into the swing of things and I think I'm getting there. I can't quite do steps or curbs yet but I can go straight, do turns and go pretty fast! 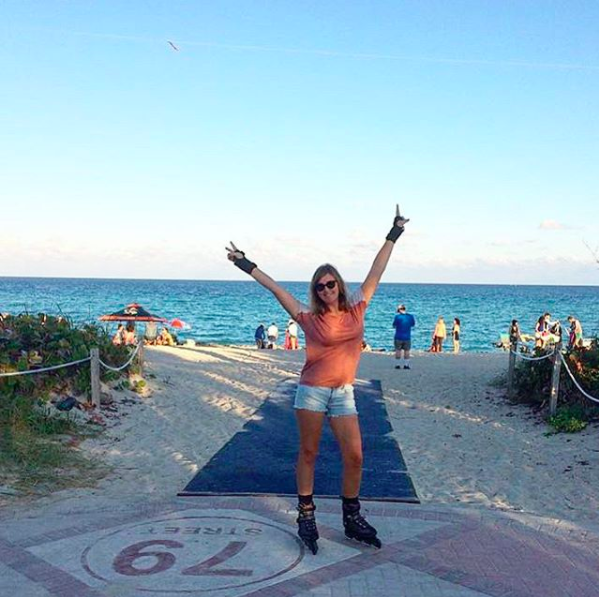 I want to learn how to do rollerblade dancing - ok maybe I am getting a bit carried away. But rollerblading is something that I enjoy doing. I don't see it as exercise which is amazing. I do it because I enjoy it, not because I think it will make me skinny! I also hope that living by the beach will help me get fit as I can go for a daily swim in the morning. I have done it a handful of times in the last 2 weeks but would love to make it part of my routine. Maybe when we have somewhere a little more permanent. So, what else do I want for 2018. I would love to start thinking about children again. It has taken us a little while to start thinking that way again and although we aren't ready yet, I hope that we can start to be ready again in the next 12 months. I don't want to rush things, so whenever is right, is fine. I would also love to work more on my photography. I have lots of ideas but at the moment with the tourist visa, I can't work. I am dying to get out there and start shooting people. I have so many ideas. I think part of the issue is me and my confidence though. I always feel surprised that someone wants to pay me to take photos of them. Even though I think I am good at what I do and I always love the photographs. I need to believe in myself a little more. And I guess that rolls into my next point. I want to start meditation and yoga. I know that isn't directly linked to confidence but it helps people as a whole. It is meant to relax the mind, take away stress, clear your thoughts etc. That can only be a good thing when trying to run your own business! Anything else? I guess the last thing would be travel. I love being here in Miami. I love the diversity and the fact that it doesn't feel like the USA - or at least how I thought the USA would be like. There are so many cultures here. Everyone speaks Spanish and I mean everyone! Which reminds me - I want to learn Spanish! I have spent 6 years learning French, now time for a 3rd language! But back to travel, I would love to visit Cuba, Costa Rica, Belize, Mexico, The Bahamas, St Lucia, Hawaii etc. I would also like to visit places in the USA while I'm here too. For example I want to celebrate my 30th birthday in Las Vegas because why not?! I want to go back to New York. I want to visit Yellowstone National Park, Niagara Falls, Boston, Texas, LA.. everywhere!! Who knows what 2018 will bring and that is the beauty and mystery of it all. I am so excited to be out of 2017 and to leave it all behind. Let's hope 2018 is incredible! Life is about balance after all! I hope you all have a wonderful 2018 and it brings you everything you want and more. I hope you spend time with loved ones, travel to new and exciting places, do things that scare you but ultimately have an awesome year and one to remember!